Beef inside round, soy sauce, worcestershire, light brown sugar, kosher salt, coarse ground black pepper, water, garlic powder, garlic salt, chili powder, onion powder, apple cider vinegar, sodium nitrite. The first flavors that I pick up on the tongue is a light garlic and touches of black pepper, along with a saucy taste. The chewing brings on more garlic, with a little more definition from the soy sauce, and more black pepper. 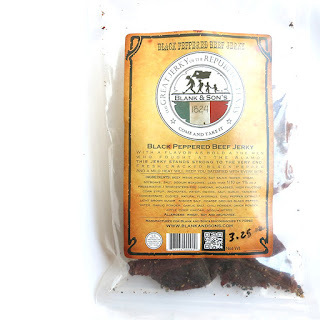 For being labeled as "Black Peppered", it certainly offers the sharp, spicy flavor of black pepper. It also has that freshly cracked flavor too, quite pungent with some heat. I'd rate this on my personal heat scale as medium (level 3 out of 5). 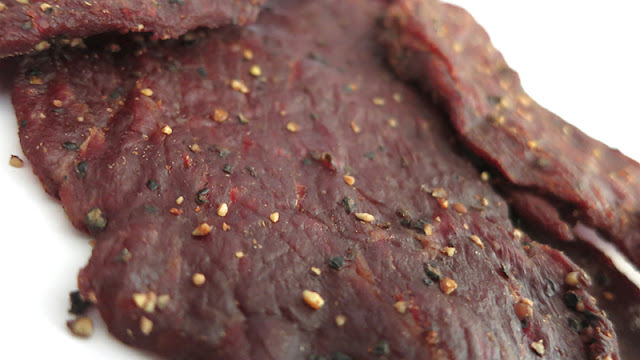 Verdict: This "Black Peppered Beef Jerky" from Blank and Sons tastes very similar to their "Our First Beef Jerky" that I reviewed last week, with a notable garlic flavor, and saucy combination of soy sauce and worcestershire, except that it adds a lot more black pepper. You definitely do get more of the cracked black pepper flavor with that pungent, sharp character and some heat to go with it. In that regards, you're getting what you pay for. I still find the saltiness in this to be rather high, to where it can wear you down after a few pieces. 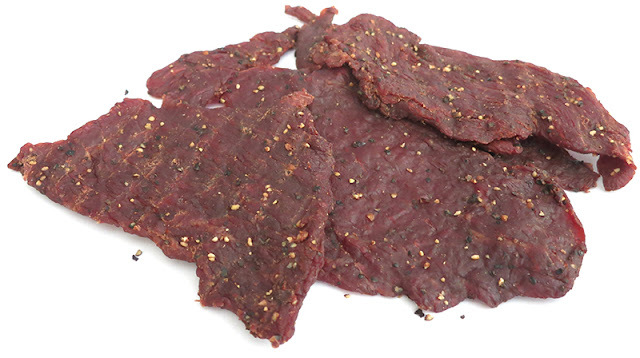 Overall, this has the great flavor as the company's "Our First Beef Jerky", as well as a great slab-style meat consitency and chewing texture, just more spicy black pepper.